After six seasons away from the majors, Chris Bando returned in 1996 - this time as a coach. Bando spent that time away as a manager for the Brewers in the minors. For 1996, the team promoted Bando to the job of major league third base coach. "We've watched Chris grow for several years in our system," Brewers manager Phil Garner told The Milwaukee Journal Sentinel after the hiring. "He offers continuity with the young players from our organization, which will be essential in the coming years." Bando stayed in Milwaukee for three seasons. That major league stint came after a nine-season stint there as a player, one spent largely with Cleveland. Bando started with the Indians at AA Chattanooga, hitting .228 in 76 games. He went on to impress Indians coaches the next spring. "I was happily surprised at the way he handles himself behind the plate," Indians manager Jeff Torborg told The Associated Press that March. "Especially the way he blocks balls in the dirt and his quickness." Injury shortened Bando's season that year, which he spent back at Chattanooga. He then played all of 1980 back at AA. In 1981, Bando made his major league debut. Bando got into 21 games for Cleveland in 1981, then 66 in 1982. Going into 1984, Bando looked to have a more regular role for the Indians. Manager Pat Corrales believed Bando was the best they had, according to The Milwaukee Journal. "Out of the three catchers, he has been the best," Corrales told The Journal. "He's worked the hardest and thrown out more runners than anybody in our intrasquad games." From 1984 to 1987, Bando got into at least 73 games for the Indians each year, including 92 in 1986. He hit a career high 12 home runs and had a .291 average in 1984. His final major league time came in 1988 and 1989, with brief time spent between the Indians, Tigers and Athletics. 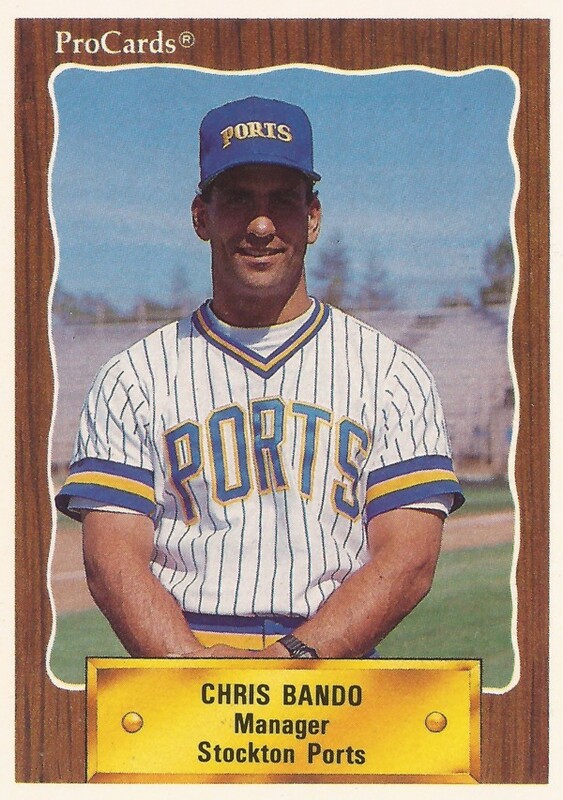 Bando then started his post-playing career in 1990, serving as manager at high-A Stockton. He moved up to AA El Paso as manger there in 1992, then AAA New Orleans in 1993. He then moved up to Milwaukee as third base coach for 1996 and 1997. He served as bench coach in 1998. He then returned to the minors. In 2001, he served as manager at short-season Mahoning Valley. In 2005, he was a scout for the Diamondbacks. More recently, he served as manager for the independent Washington Wild Things in 2012.